The half wave rectifier conducts current only during the positive half cycles of the input supply voltage. The negative half cycles of the a.c. supply are suppressed. So no current is conducted and hence no voltage appears across the load. So current always flows in one direction (i.e. d.c. ) through the load. Fig(1) shows the circuit connection of a half wave rectifier . 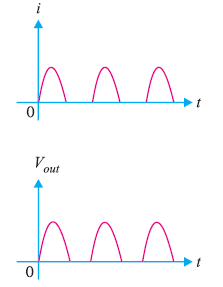 Fig(2) shows the input and output waveform of a half wave rectifier . In this circuit a single crystal diode is used as a half wave rectifier . The a.c. supply is normally applied through a transformer. It gives two advantages. First it allows us to step up or step down the a.c. input voltage as required. Secondly, the transformer isolates the rectifier circuit from power line and thus reduces the risk of electric shock. During the positive half cycles of input supply voltage, end A becomes positive with respect to end B. This makes the diode D forward biased and hence it conducts current. During negative half cycles, end A becomes negative with respect to end B. So the diode D is reverse biased and hence conducts no current. So current flows through the diode only during the positive half cycles of the input a.c. voltage. In half wave rectifier , output across the load is pulsating. So a filter circuit is used to smoothen the output. The output is pulsating, so a filter circuit is required. The a.c. supply delivers power only half the time. So output is low. The output frequency of a half wave rectifier is equal to the input frequency i.e 50 Hz. The ratio of d.c. power output to the applied input a.c. power is known as rectifier efficiency. The diode conducts only during the positive half cycles of the a.c. supply. The output current is pulsating direct current. This means in Half wave rectifier , a maximum of 40.6% of a.c. power is converted into d.c. power.